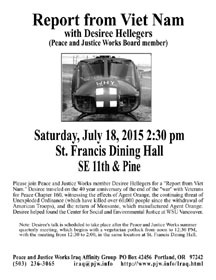 Please join Peace and Justice Works member Desiree Hellegers for a "Report from Viet Nam" on Saturday, July 18, 2015 at St. Francis Dining Hall, SE 11th & Pine. Desiree traveled in April 2015 on the 40 year anniversary of the end of the "war" with Veterans for Peace Chapter 160, witnessing the effects of Agent Orange, the continuing threat of Unexploded Ordinance (which have killed over 60,000 people since the withdrawal of American Troops), and the return of Monsanto, which manufactured Agent Orange. Desiree helped found the Center for Social and Environmental Justice at WSU Vancouver. Desiree will be joined at the talk by two special guests. Portland activist Becky Luening, who has been with the Vietnam Friendship Village Project USA since 1996, will speak about the Project, which provides therapy and medical care for over 100 children and 40 adults with various needs. Also speaking will be Don Blackburn, a member of Veterans for Peace Chapter 160 Viet Nam and a staff person at Viet Nam Association of Agent Orange Victims, who also works on the Committee for Friendship Village Viet Nam and was an integral part of the April trip. Note: Desiree's talk is scheduled to take place after the Peace and Justice Works summer quarterly meeting, which begins with a vegetarian potluck from noon to 12:30 PM, with the meeting from 12:30 to 2:00, in the same location at St. Francis Dining Hall. Get more information from Peace and Justice Works at 503-236- 3065 or pjw @pjw.info.